It has been almost five months since I last posted an update, a lot has happened since then. Five months ago they had cleared the lot, it was totally bare. Now, they have dug down and created a large basement. 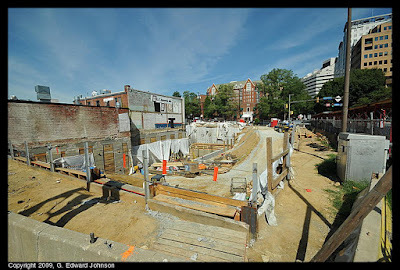 They have put in most of the concrete walls to hold the dirt out, the exception being along the ramp down into excavation. I suspect the ramp is temporary and will be removed once they no longer need heavy equipment at the bottom of the pit. 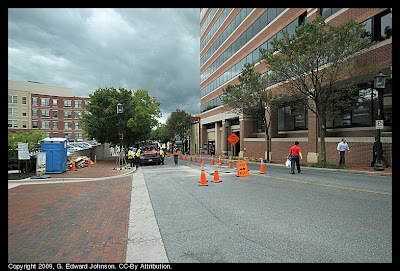 If you missed the earlier posts, this construction is along Woodmont Avenue in Bethesda, MD. 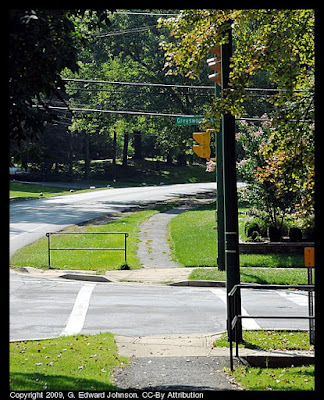 It also borders Hampden Lane and Elm Street. Equinox Fitness will be moving in here with a four story 31,000 square foot fitness facility that includes amenities such as a full service spa, a pool, cafe/juice bar and five group exercise studios. 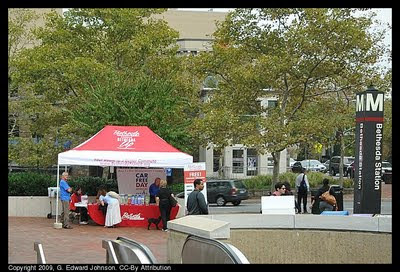 Bethesda Transit had a tent up at the top of the metro escalator by the fountain today where you can get commuting information (and prizes), it is/was there from 6:30 to 9:30am. Why? because today is Car Free Day (or car-lite day). Unfortunately you probably missed your chance to stop by the tent but you can still click on the links above and find out more. (I already have driven today so I clearly missed the memo). 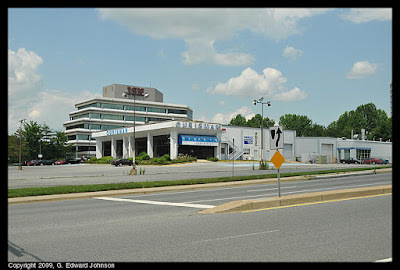 The Montgomery County planning board approved the site plan for redeveloping the former Ourisman Ford dealership near Montgomery Mall. 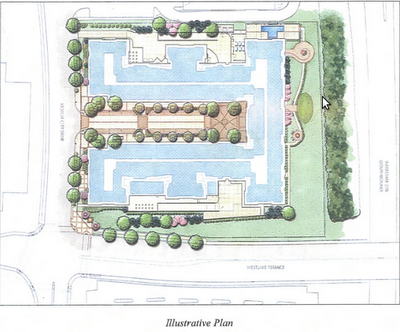 The plan is to put in 340 apartments, 42,000 square feet of retail, and 12,000 square feed of restaurant space. 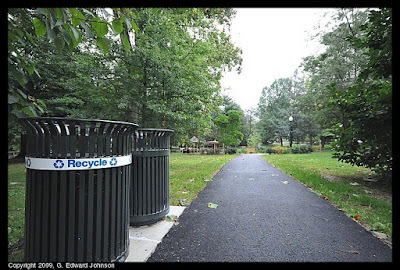 The project is located at the corner of Motor City drive and Westlake Terrace. It backs up to Interstate 270 and is across Westlake Terrace from Montgomery Mall. The Ford dealership closed a little while ago and the site is currently unused. The building will be 6 stories tall with an internal street to provide access to some of the retail and restuarant space. From above, the building will look like a U with the base of the U towards I-270. The noise from I-270 can be significant. 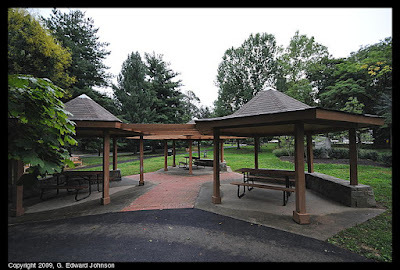 To address this, the area closest to the interstate will be outdoor recreation areas, including an inground pool, a putting green, and a patio with fire pit. The pool will have a 6 foot high concrete wall on the north side. 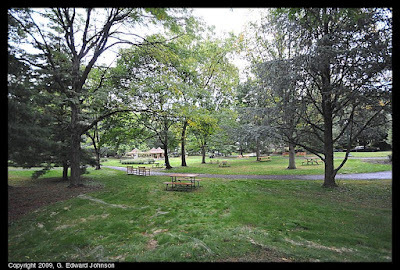 The developers will add a berm or barrier along the east side to keep the noise in the recreation area below 65 decibels. The walls of the building closest to I-270 will have extra noise-reducing properties (windows and doors rated at 34 STC and walls rated at 56 STC). 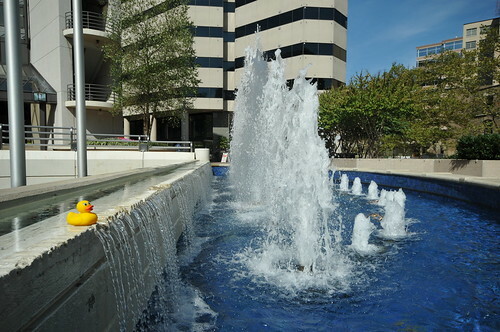 I'm a bit suprised by both the intended use and the design of the building. I expected this to stay fully commercial. The design, with mixed residential and commercial is more what you expect to see in a downtown area, not right next to a suburban mall. This doesn't make it bad, in fact, it makes a certain amount of sense. 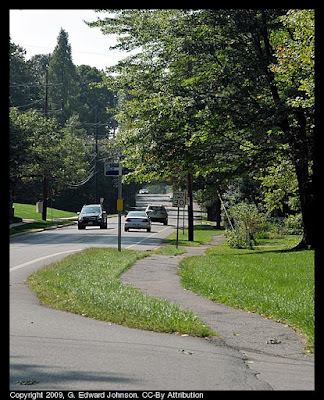 I'm sure a lot of people would like to live right next to a highway entrance, a good chunk of your commute can be just getting to the main road. 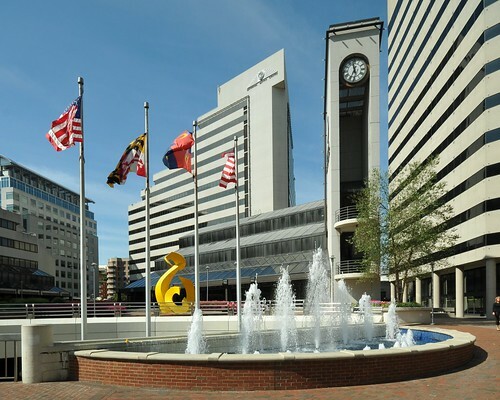 If you like shopping, being one parking lot away from Montgomery Mall is pretty attractive. I think for this to really work though there will need to be more residential, like if they redeveloped the Expo Design building into residential. To support the on-site retail you either need lots of people living within walking distance or you need to draw people from outside the area there. With the mall and the other strip-mall shops in the area, and lack of on-site parking, getting people from outside the area will be tough. Having another large apartment complex right next door would be helpful. 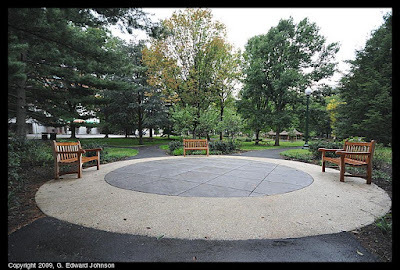 You can find out more at the Park and Planning website. 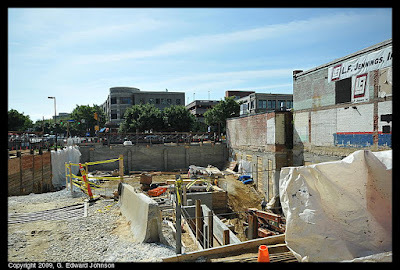 Here are a couple of construction pictures of a building going up that opens to both Woodmont Avenue and Cordell Avenue right in downtown Bethesda, MD. It is going to have office space and retail and is supposed to be ready in the fall, but that may prove to be optimistic. 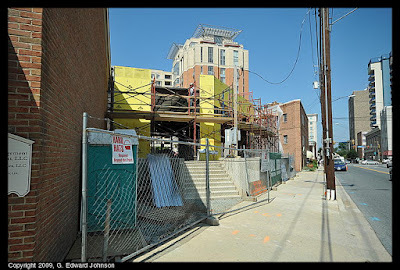 I don't think I like the stairs and retaining wall look that it has on Woodmont. I have posted about this site several times, you can follow along. 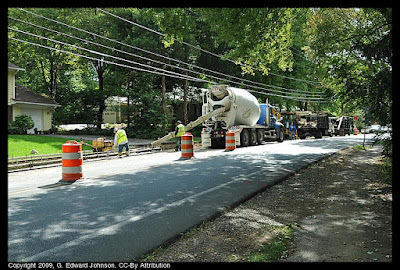 Some of the stimulus money is making it's way to Montgomery County. 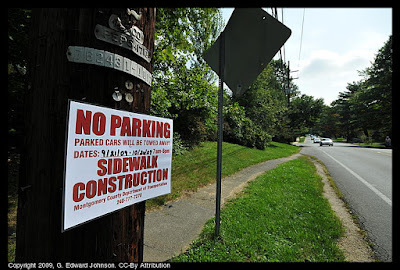 I saw this sign on Old Georgetown Road in Bethesda, MD. 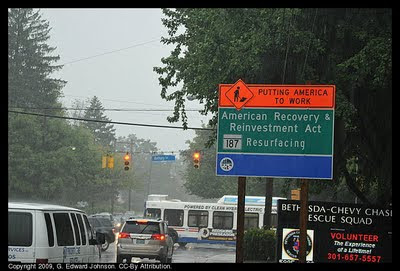 It says "Putting America To Work", "American Recovery & Reinvestment Act Resurfacing MD-187" The sign just went up yesterday and I am not sure when it will start, but it should be soon. I sense a little bit of propaganda at work here, they really want you to know who is doing it. I think they went a bit over the top with it, number of words on sign: 12, number of words that tell you want is going to happen: 2. I also like the blue sign at the bottom which is blank except for the recovery.gov logo, I guess they couldn't decide on what to write there. As an aside, walking two blocks in the rain to get the picture wasn't as fun as I thought it would be. It was really raining hard. 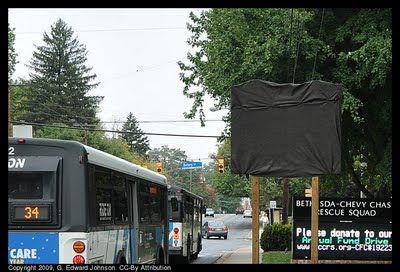 Update Sept 21: The sign is still there but it has been covered over with black cloth. I guess they are going to uncover it when they are ready to start the repaving. Update Sept 22: here's the covered sign. Update October 7: The sign is back to being uncovered and I saw them putting construction barrels along the southbound side of Old Georgetown Rd. There is also a second little blue sign that says "Martin O'Malley, Govenor"
It's official. 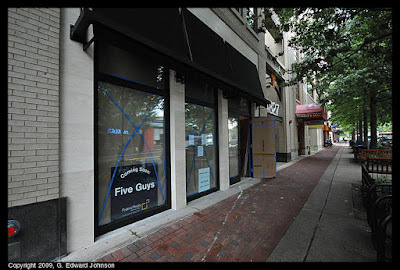 Five Guys burgers and fries is opening up in the old apple store on Bethesda Avenue. I went by there and peeked through the door, there is still a lot of work to do so I don't know when it will open. 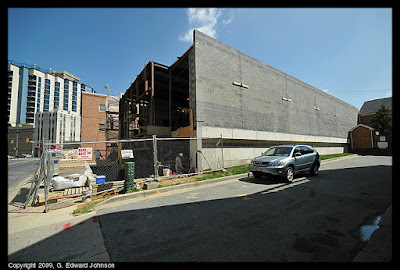 The five guys website lists it as "coming soon" with an address of 4829 Bethesda Ave, Bethesda, MD 20814. 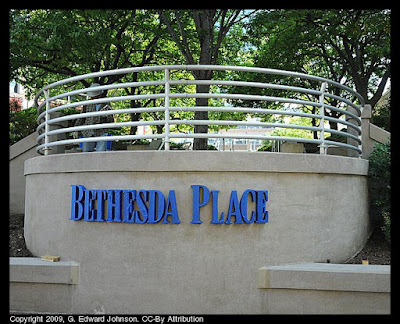 I'd heard they were coming to Bethesda Ave a few months ago but twitter user @Dominic_Murphy pointed out the location to me. That makes at least three burger focused places, Crossfire, BGR (stupid flash website, no link for them), and now, FiveGuys. Did I miss any?